This sugar body scrub is made with coconut oil, sugar and essentials oils. It’s super easy to make and I’ve even included free printable labels if you want to give away a few to your friends. This project is perfect for “make and takes”, girls night out or any group gatherings where you want to enjoy creating something while sharing time with others. Of course, it also makes a great gift. A good body scrub nice to use all year long. In the winter when your skin is so dry, a sugar body scrub is helpful and it’s fairly gentle on your skin. It’s also great for exfoliating and polishing skin during the warm weather months when you are showing a lot more skin. And, if you’re fair skinned like me you probably hate showing your white legs in public. I don’t have the time to lay out in the sun, and with my family’s skin cancer history, it’s probably not a good idea anyway. So, I often resort to using a sunless tanning product. I’ve tried many and they all smell bad. The one that has worked best for me is St. Tropez Bronzing Mousse applied with a foam mitt for even coverage. The other key to obtaining a natural, even tan, with a sunless tanner is to make sure your skin is exfoliated. They all tell you this in the directions. Exfoliating your skin removes dead skin and allows the product to go on smoothly and last longer. This is where the sugar body scrub comes into play. Using a formula of 2 to 1, sugar to coconut oil, you can make your own homemade sugar scrub, which is perfect for exfoliating all the dead skin on your body. For this one, I also added a drop of red food coloring to make it a pretty blush pink color. Just like the center of my pretty peonies. Adding, several drops of essential oil will make it smell great too. Feel free to use any combination of oils that you like best. I used a variety of citrus, lavender, and patchouli. If you want to learn more about blending essential oils, check out this article about perfume oil. You could also use fragrance oils for this project. They are cheaper and you can sometimes find scents that are not readily available in the essential oil market. I’m using 8 oz. plastic jars for safety in the shower but you could use mason jars. If you want to make some to give away or sell, feel free to print out the label above which fits perfectly on a sheet of Avery 5294 round 2.5-inch labels. Just click on the image above and it will download to a Word document. Follow up with a good moisturizer or a dry body oil spray. P.S. 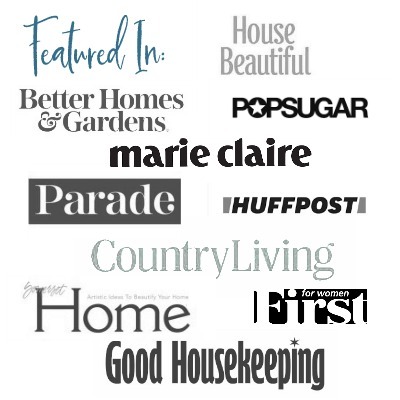 There are many other fun bath and body projects on this blog like homemade herbal bath salts and shower steamers and tinted lip balm to name a few. All make great gifts and would be fun to create in groups. 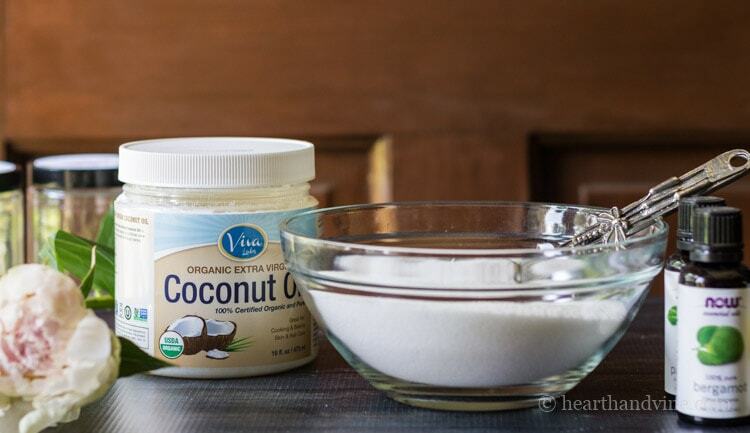 Combine sugar and coconut oil in a medium bowl. Whisk together until smooth. Add essential oil and mix well until you the scent strength you desire. How long does these scrubs last? Britnie, the ingredients in this sugar scrub should last at least 6 months. However, getting water in it (using it in the shower) and possible bacteria from your hands could cause it to grow mold. So far, I’ve been able to use it up before there was a problem. I usually purchase mine on Amazon. However, you can find essential oils just about anywhere these days. I have seen them at Walmart, TJMaxx and Trader Joes. The quality does vary but I’m no expert so I can’t say one is better than the other. One brand I have found to be good and affordable is NOW. Have fun crafting. Wouldn’t the food coloring, stain ur skin? Or make ur skin that color? No. I have not found this to be the case. Perhaps its because there is the smallest amount of red food coloring in this sugar scrub making it a light pink. That’s good to know. I have never used that kind of ingredient for color or any other benefit but it does sound interesting. What if you are allergic to coconut? What other oil can be used? Mashi, you can use any carrier oil. Sweet Almond, jojoba oil, sunflower, olive oil, etc… The only difference it that coconut hardens as it cools, so the consistency is thicker but they all work. I’m so glad you like the scrub and I hope your daughter and new daughter-in-law love it too. This sounds wonderful. I had a friend give me some epsom salts that she added lavender essential oil to and what a relaxing combo to add to the bath. My feet especially need the exfoliation in the summer as I wear sandals constantly and it takes extra scrubbing to get the dirt off. This works great on dry feet. If you want something a little stronger you could try table salt for your feets too. What a neat gift idea, this stuff is expensive when you purchase from retailers. Like you, fair skin, white legs and it’s all good. I’ve given up on laying in the sun years ago. I’m running into some additional time lately which means I’m learning to relax and I’ve been making some fun things here and there so this is going on my list for next week. Thanks!